Well, there is certainly nothing dull about this contemporary wedding in Sheffield. Bride Daisy’s uber cool style undoubtedly shines through with her gorgeous Laure De Sagazan gown, bright red lipstick and epic flower crown. And by her side are her beautiful bridesmaids in black floral dresses and matching scarlet shoes. The sultry red and blush tones are carried through to the flowers. With immense hanging floral installations of roses, peonies and foliage finishing off industrial venue 92 Burton Road beautifully. Turns out your Tuesday afternoon just got a whole lot brighter. Enjoy! Daisy & Patrick: We got married in St William of York Catholic Church. This meant a lot to us as it is where Pat’s parents got married. Our reception venue was 92 Burton Road in Kelham Island. We needed a big space and wanted to be able to make it our own with the decoration, food and entertainment so it was perfect for us. 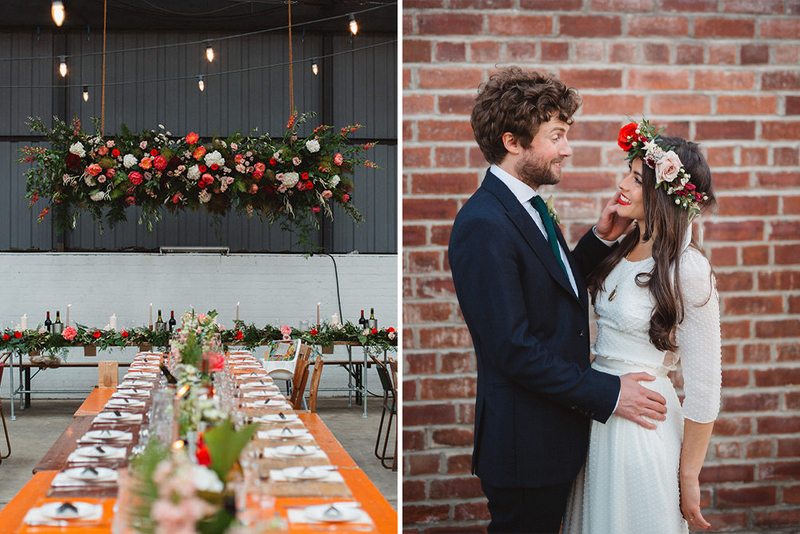 When we decided on getting married in a warehouse we knew that the flowers and lighting were going to make the venue. The flowers were done by Petalis and I could not recommend Catherine, the owner of the shop, highly enough. She has such an amazing eye and has so much creativity. When Catherine brought the bridal parties bouquets and my flower crown they were absolutely stunning and then on arrival at the venue I was lost for words. In particular, the flowers hanging above the top table were unlike anything I had ever seen before. Flowers included Nina (burnt orange) Roses, Quicksand Roses, Albuca, Lysimachia, Astrantia, ‘yearning desert’ Amaranthus, Forget-me-not, Hypericum, Brunia, Peony, mixed Eucalyptus, Pistache leaf, Asparagus fern. The colours really popped and made the venue. We collected spirit bottles to decorate the tables and put flowers in. This really suited the venue and worked well with all of the candles running down the tables. We made our own napkins from calico and had a copper theme running throughout. With the venue being so big we needed to really think about how to stop it from feeling empty. We did this by using large beer barrels dotted around the room, having a vintage sofa area, and a kids area including a football table and teepee. My dress was the Baudelaire by Laure De Sagazan. When I first tried it on at The Mews Bridal, Notting Hill I fell in love with it. It was vintage and totally me. For me what made the dress so special was the material and all the little details including the lace back, pearl buttons and frilled band around the waist. I wanted something I felt comfortable in and that suited the venue and I certainly found that. The staff at The Mews were absolutely amazing, in particular, Natasha who made me feel at ease and so welcome. The shop is just gorgeous and everything was so professional. We ended up also buying the flower girls dresses from there. My shoes were Faber Novella, an Italian make that I fell in love with when I wore them to try the dresses on at The Mews. I always wanted to go for a red shoe and something that I would wear again. Pat wore a navy suit from Reiss and a lovely pair of burgundy Loakes. The dads, groomsmen and best men all wore their own suits but had matching green knit ties, pocket squares and buttonholes. I and my bridesmaids had their make-up done by Amy George. I picked up her card at the Sheffield Indie Wedding Fayre and when meeting her for my trial I knew instantly that I wanted her to do my wedding make-up. She was so friendly and showed a genuine interest in our wedding plans. She used the most beautiful products and really knew her stuff. We all wanted a natural look and she really listened to everything we asked for. The pop of colour Amy used on my lips was a perfect match for my flowers and shoes. She really was amazing and I could not recommend her highly enough! Due to the number of people coming to our wedding, we knew that we wanted to go for something more relaxed that would be easy to serve and share on the tables. We wanted to design our own menu and found it difficult to find a company that allowed us to do this. We ended up using Jamie Bosworth, a friend who is well known for his catering around Sheffield, in particular for pop-ups, dinner parties and gourmet buffets. Due to the size of the wedding, he then enlisted the help of Marcus Lane, who specialises in providing bespoke dining in your home or venue of choice. Jamie and Marcus came to my parents’ house and cooked in their kitchen. This made the process so much more personal as we got to know them as well as their style of cooking. We started the meal with bread, dips and olives which came to the table for guests to then help themselves. Our main course included three sharing bowls of a chicken bhuna with caramelised onions, smoky Mexican bean chilli, finished with Aioli and coriander and a spiced lamb tagine with apricots and flaked almonds. Alongside the main dishes were a vegetable rice admixed grain salad with green beans, spring onions, roasted tomatoes and feta crumb. We loved that guests were able to help themselves to all three main dishes or just the one they preferred. For dessert, we had the wedding cake which was cut up by Jamie and each table had a big chunk of each flavour cake to share. This was accompanied by red berries and clotted cream. Our cake was made by Sara at The Bake Lab. It was a simple 4 tier naked cake containing three distinct flavours – chocolate fudge cake with salted caramel, lemon drizzle cake with lemon curd and vanilla cake with raspberries. All the cakes were made from scratch using clean label ingredients to ensure the best quality. The simple design provided a graphic backdrop to showcase lots of seasonal berries and beautiful flowers taken from my bouquet. For anyone that didn’t have a sweet tooth, we also had a cheesecake provided by Porter Brook Deli, accompanied by a selection of bread, crackers, fruit and chutneys. In the evening we had wood-fired pizzas by Nether Edge Pizza Company. Guests were able to go up in their own time and order from a range of pizza toppings and enjoyed them outside around the fire pit or learning on a barrel in the venue. It was so relaxed and that’s what we loved about the wedding! This is one part of the day I would love to go back and do all over again. Pat was too nervous to eat and I was too busy spending time with the guests. We would both love to eat the meal again! Music was always going to be a big part of our wedding. From the piano version of Into My Arms by Nick Cave at the Church, our DJ Ben Babinski and the band the boys like to call The Wedding Zingers. The band during the evening really made my night. They played a range of covers from David Bowie to All Saints, a little something for everyone. The fact that all of the people playing in the band were family and friends made it so special. This was one element of the wedding that Pat and I were dreading. Neither of us enjoy having our photos taken so finding a photographer that was discrete and able to capture natural moments rather than staged was really important. Danni made us feel at ease on the day, she was so relaxed and professional and it was really lovely to have her there. I cannot thank Danni enough for the gorgeous photos we now have. The colours on the photos look amazing and there are so many of our gorgeous guest which was just what we wanted. If you are looking for a creative, yet natural photos Danni really is the person for you! Oh my word! I can’t stop looking at these pictures – SO beautiful! But where are these bridesmaids dresses from? I need this info in my life!